Learn how to select an SD-WAN solution that meets the needs of your organization. Many organizations are eager to adopt new SD WAN capabilities. 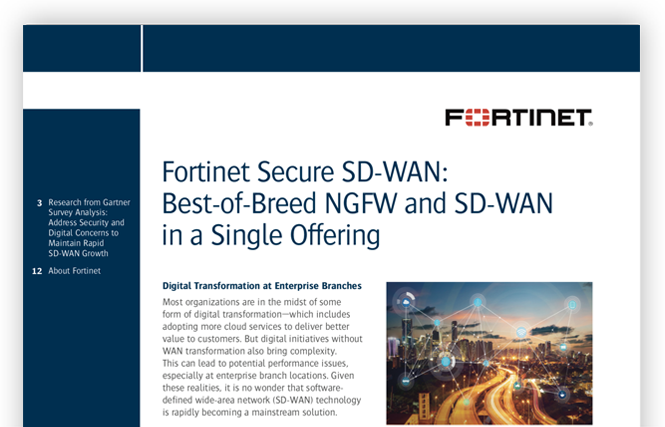 Recent Gartner research shows that over 40% of enterprises are expected to adopt SD WAN by end of 2019. However, technology managers must find SD WAN solutions that meet the needs of both digital applications and secure cloud connectivity. Gartner does not endorse any vendor, product or service depicted in its research publications, and does not advise technology users to select only those vendors with the highest ratings or other designation. Gartner research publications consist of the opinions of Gartner's research organization and should not be construed as statements of fact. Gartner disclaims all warranties, expressed or implied, with respect to its research, including any warranties of merchantability or fitness for a particular purpose.